Dutrion tablet is a transportable, non-explosive, non-corrosive, one-component tablet, which once added to water, reacts quickly and safely into a long lasting chlorine dioxide (ClO2) solution. Like ozone, ClO2 is soluble as a true gas. Because it is a true gas in solution, it is easily diluted into target water as a biocide. Dutrion works on the biocidal component of chlorine dioxide. Although chlorine can be found in the name of it, Dutrion is NOT a chlorine type of disinfectant and it does not release free chlorine (hypochlorous acid) to provide its biocidal function. When Dutrion is applied; the chlorine dioxide molecules take over the biocidal kill of the full spectrum of bacteria, algae, fungi, protozoa, yeast and viruses. Dutrion is a convenient, economical and safe method to produce ClO2 in solution without generating by-products, such as chlorite, chlorate, chloride or free chlorine. It does not form toxic and carcinogenic by-products. This makes ClO2 one of the most eco-friendly biocides available. Extensive studies by the US Environmental Protection Agency (EPA) and World Health Organization (WHO) have confirmed the safety of chlorine dioxide. Dutrion has broad spectrum capacity to kill microbes such as bacteria, fungi and sporangia, viruses and epiphytes. It has no side-effect to superior species (plants, animals, humans). Microbes will never become resistant to Dutrion as the product penetrates the cell wall, decomposes polypeptides and destroys the interior RNA and DNA. As a strong oxidative agent, Dutrion will decompose almost all reductive materials in water. This includes residual feed and excrement, resulting in an improved environment in fish tanks and ponds. 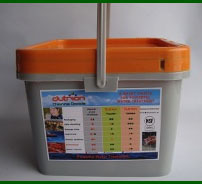 Dutrion also enhances indirectly the concentration of dissolved oxygen (by reducing the BOD). The net effect is to prevent the break out and promulgation of epidemics in fish and shellfish farming. The corrosive effects of Dutrion are negligible. While the disinfectant action of chlorine stops when the pH values exceed 7.5, chlorine dioxide is fully and steadily potent on pH levels between 4 and 10 (sea-water pH is around 8.25) as well as in the presence of ammonia and amines. ClO2 controls the bio-film in pipe-lines along the water distribution systems by penetrating the bacterial slime layers and destroying the pathogens. Dutrion is used in drinking water treatment, water purification, food and beverage industries, hospitals, hotels, horticulture, aquaculture, agriculture, livestock, poultry, crop irrigation and many other applications. l Transportation water (live fish transport). 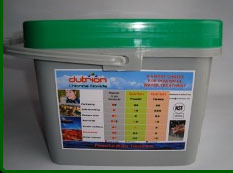 Dutrion can be used at 0.05ppm for the transportation of eggs to the hatchery, or at 0.1ppm for the transportation of fry from the hatchery to the growing cages at high stocking densities when there is risk of infection caused by surface to surface contact and de-scaling. l Fish egg and larval sanitation and disease prevention in holding tanks. Dutrion can be used as a short-term bath at the first sign of bacterial or fungal infection, in order to reduce the risk of opportunistic infection. Residual feed and aquatic excrement contaminates the water and the water body significantly deteriorates, leading to the rapid propagation of pathogenic microbes. Dutrion may be dosed into the water at a rate of 0.05~0.1 ppm. The dosage should be adjusted according to the quality (e.g. turbidity and organic content) of the water. l Treatment and control of disease spread in fish holding tanks. Dutrion may be dosed at 0.15~15 ppm and repeated daily for 3 to 5 days. l Ice making. 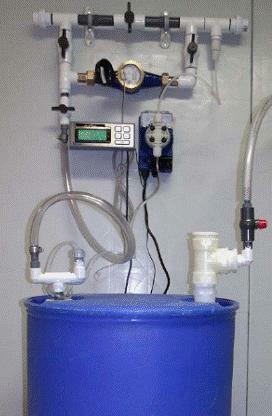 Water is the most important raw material used in processing systems. The quality of the process water determines the hygiene of food products. The use of contaminated water in food processing plants can spread infection across the entire distribution system and contaminate entire batches of produce. Water, whether obtained from a municipal source or any other source, may carry bacteria or viruses. Many are harmless, but others may include faecal coliforms, E. coli, salmonella, legionella and listeria. 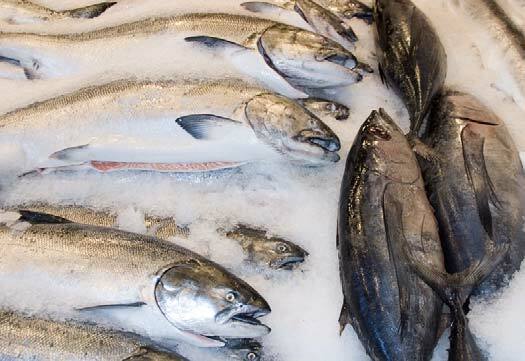 The ice used for packing fish should be manufactured with ClO2. Dutrion may be dosed at 10~30 ppm in water destined for ice-making. The slow release of ClO2 onto the surface of fish as the ice melts helps to prevent spoilage and odours during transport. l Dipping de‐scaled and gutted fish to prolong shelf-life. ClO2 is proven against botulism organisms and other food contaminants such as salmonella, staphylococcus, streptococcus etc. in the presence of high organic loading Even the most resistant strains of fungi are completely destroyed in 60 seconds. The most difficult organisms of all (spore formers) are destroyed in 5 minutes. Dutrion is safe and requires no restrictions on use in direct contact with food. It may be dosed at 10~30 ppm. l Discharge water and dead biomass treatment. The fish industry has the potential for generating large quantities of solid wastes and contaminated effluent/ wastewater. ClO2 is effective in treating wastewater discharges and removing odour problems associated with fish processing plants. Dutrion may be used at 10~100 ppm concentrations in order to deodorise and sanitise dead biomass or heavily contaminated effluents. l Destroy pathogens and bio-film in pipelines. There are a variety of nutrient sources within water systems. These include scale, sediment, corrosion products and other trapped organic and inorganic matter. Micro-organisms thrive in the presence of water and nutrients. 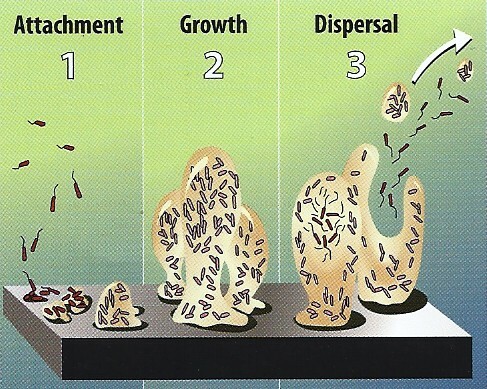 When micro-organisms find a suitable surface they attach themselves and initiate multiplication. Growth can be rapid, with new cells attaching to each other as well as extending laterally across the surface. The movement of the water ensures that colonies receive a constant supply of nutrients. When this is combined with suitable temperature, often found inside heating systems, such as heat exchangers, the perfect conditions exist for rapid microbial growth. The population will predominantly consist of aerobic (oxygen seeking) and anaerobic (living without oxygen) bacteria. This creates a "woven matrix colony" in which other organisms can grow and develop. This matrix is often referred to as "slime" or "biofilm". There will also be traces of fungi and algae, which in turn support predatory organisms such as protozoa and metazoa. These predatory organisms ingest bacterial cells for food. The control of biofilm within water systems is essential. The bacterial presence poses a constant threat to health. They have an impact on energy requirements of a system, cause corrosion and increase frictional drag. Biofilm is 85-95% water. It acts as an insulating layer of stagnant water. As water has one fifth the thermal conductivity of carbonate scale, a 1mm biofilm has the insulating properties of a 5mm scale coating. This results in greatly reduced heat transfer efficiency at heat exchange surfaces. Anaerobic sulphate reducing bacteria can form and live in biofilm. These produce sulphuric acid which will corrode pipes and can result in leaks. Anaerobic iron-oxidizing bacteria can cause serious corrosion to pipes, leading to high maintenance costs and loss of production. 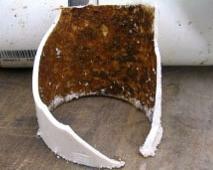 As a biofilm proliferates in a pipe, it reduces the diameter. This causes frictional drag, pressure drops and a need for more pumping power and increased costs. Dutrion may be used at 100 ppm to 1ppt concentrations in order to remove biofilms from pipelines. At the recommended concentrations Dutrion is harmless to man and animals. It is non-toxic, non-caustic or irritant for the skin, eyes or mucous membranes. Nevertheless, the dense product should be handled with reasonable caution (e.g. wear gloves etc. appropriate personal protective equipment). When the dense product comes into direct contact with skin or eyes, rinse with plenty of water for several minutes. Do not ingest. Keep away from children. Available in 1g and 20g tablets. 200 x 1g tablets per pack (200 x1g), or 25 x 20g tablets per pack (25 x20g). Also available in two component powder form (see below). Store in original container protected from direct sunlight in a dry, cool and well-ventilated area, away from food and drink. Separate from reducing agents and combustible materials. Keep container tightly closed and sealed until ready for use. Use original container. Containers that have been opened must be carefully resealed. Do not store in unlabelled containers. 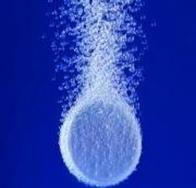 Dissolved Dutrion tablets remain potent during 30 days (e.g. at 0.2% stock solution when a 20g tablet is dissolved in 1lt water). The tablets' shelf life is 2‐5 years, depending on storage conditions. Dutrion Powder comes as a 2 part component kit. 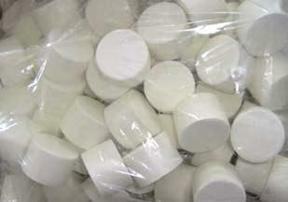 Powder A (Sodium Chlorite and additives) and Powder B (Sodium Bisulphite and additives). Mixing equal amounts of Powder A and Powder B in a specific amount of water quickly generates an activated solution of chlorine dioxide. The advantage of Dutrion Powder over Dutrion Tablets, in addition to lower cost, is that the components are not oxidative, hence do not get reduced as long as the two powders are kept apart (long storage of raw materials). The disadvantage of the powdered form is the need to mix the two powders at exactly equal amounts (weight) in a specific amount of water (volume) and produce a stock solution with which the water is dosed accordingly. The stock solution remains potent and may be used for 30 days. Often a "dosing unit" is required to maintain the appropriate concentration of Dutrion by dosing/pumping continuously out of the stock solution and into the passing water. 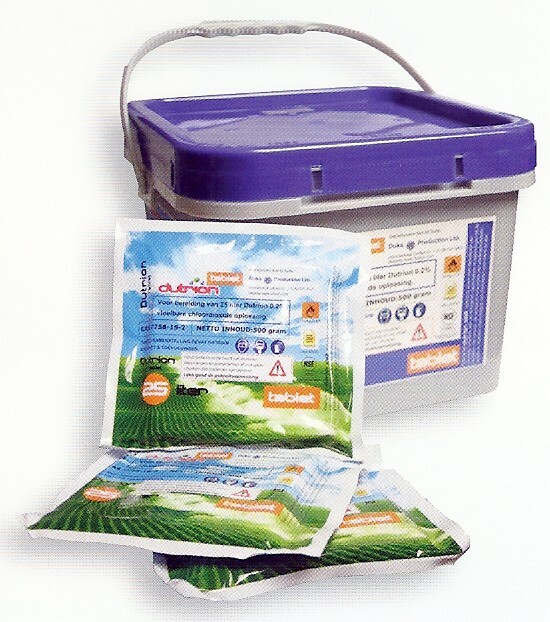 5 x 1kg aluminium bags in a pail (5 kg), 4 pails in a carton (20kg). Chlorine and chlorine type disinfectants (e.g. sodium hypochlorite, calcium hypochlorite etc) generate so called "free chlorine". This free chlorine, also known as hypochlorous acid, is the biocidal component that does the actual killing of pathogens but also form very dangerous by-products in water (THM, HAA, Mutagen X, etc.) Free chlorine is released by chlorine and chlorine type disinfectants when applied in water. The disinfection by-products (DPBs) are too dangerous to accept anymore in potable water or food. Chlorine is still used in large quantities because it is mainly inexpensive and easy to use. Unlike chlorine, which starts to oxidize all inorganic and organic matters in the water first before starting to kill the micro-organisms, Dutrion is a highly selective oxidizer, killing the micro-organisms first instead of oxidizing organics in the water. This has numerous advantages vis-à-vis chlorine, such as the short contact time (typically 2-10 minutes). Due to its selectivity, the consumption of Dutrion is low. Often, up to 60-80% of the initial concentration can be found at the tail end, which gives Dutrion its residual disinfection capacity throughout distribution systems (up to 72 hours, whereas chlorine only has limited time such residual). Last but not least, Dutrion does, contrary to chlorine, not hydrolyse into the water to react with organic matters to form disinfection by-products (DPBs). Very high disinfection activity against bacteria, viruses, protozoa, algae and fungi. Low disinfection action against viruses and protozoa. Chlorine Dioxide exhibits long term residual disinfection effectiveness. Chlorine exhibits much shorter effectiveness in water systems. Its action is rapid and takes 1‐10 minutes to act on microbes. Chorine takes 1/2 ‐ 1 hour to act on microbes. The residual effect ClO2 remains high from starting point of dosing to the end point in supply. Chlorine very often shows only 20% residual at the tail end of distribution system, which means high dosing at the front end. Persistence of disinfectant is very high, decomposed through hydrolysis, much slower than chlorine. Low persistence of disinfectant rapidly decomposed in the distribution system and low residual levels at the tail end. Dutrion penetrates the biofilm, strips it out and prevents re‐growth. Chlorine in drinking water concentrations cannot penetrate the biofilm and hence it cannot strip biofilm. No corrosion effect on pipeline materials in contact and dosing pumps and other instruments in line. Chlorine is highly corrosive in nature, especially in combination with lower pH values. Chlorine forms toxic THM reacting with ammonia. No resistance building of microbes imparted against Dutrion. Microbes have developed high resistance against chlorine and chlorine products. Water taste won't be affected after treatment at disinfection concentrations, hence "fresh water". Chlorine changes the taste of water badly. No smell at disinfection levels. Chlorine changes the odour of water negatively. Dutrion dosing is very flexible and depends on optimization process. Dosing 0.05 - 0.5 ppm is common. Typically 1‐2 ppm for drinking water disinfection, but never less than 0.5 ppm. Taste and smell issues above 2 ppm start to develop. Chlorine presents low efficacy and has narrow spectrum antimicrobial activity among disinfectants. It reacts with water and generates free chlorine (HOCL) that finally acts on microbes. ClO2 presents best efficacy at wide range of pH values (4‐10). Chlorine reactions are greatly affected with the change of pH. Chlorine dioxide shows good efficacy at low temperatures. Chlorine shows low efficacy at cold temperatures. Chlorine dioxide shows good efficacy at high temperatures (> 45°C.). Chlorine shows low efficacy at high temperatures (> 30°C). Dutrion is not explosive in any way. Chlorine (gas) is very explosive and dangerous. Operational safety is high with minimum precaution. High efficiency to oxidize iron and manganese compounds. Very low efficiency to oxidize iron and manganese compounds. Oxidizes hydrogen sulphide, phenol, mercaptans, cyanide, pesticides. Chlorine is not efficient to oxidize these substances. Ct value for 99% inactivation of Giardia at 25° C. for chlorine dioxide is 7.3 mg.min/L at pH 6‐9. Chlorine is not very effective against Giardia. Ct value for 99% inactivation of Cryptosporidium at 22° C. for chlorine dioxide is 40 mg.min/L at pH 6‐9. Chlorine does not kill Cryptosporidium. Eco friendly, no undesirable residues; chlorine dioxide has the future. Chlorine destroys the environment. Was important the last 100 years.